Why cellists like Sergei Roldugin are the most rebellious musicians in the orchestra. While the cello may sound stately and dignified, cellists are often anything but. 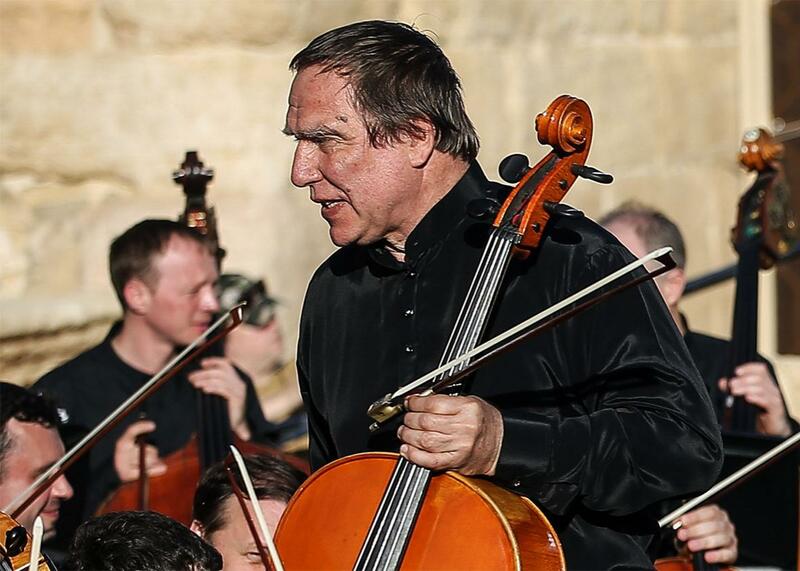 Sergei Roldugin performs in a concert by Mariinsky Theatre Symphony Orchestra at the ancient Roman amphitheatre in Palmyra, Syria, on Thursday. Sergei Roldugin, the professional cellist most famous for holding top posts in Russia’s Mariinsky Theatre Orchestra, told the New York Times in 2014 that he was no more than a humble musician. “I don’t have millions,” he insisted at the time. But with the Panama Papers leak in April, a sharply different picture has emerged: Businessmen from Vladimir Putin’s inner circle have funneled $2 billion through offshore companies registered in Roldugin’s name. The cellist has dismissed claims that he is safeguarding funds for Putin, and he maintains that the money was used to buy expensive antique instruments for students. If it sounds unlikely that a classically trained player of the most stately and rhapsodic of string instruments would be involved in such uncouth adventures—John Oliver certainly found it incredible—you don’t know your cello history. Indeed, if any instrumentalist was going to be involved in a wild international money-laundering scheme, it was probably going to be a cellist. The instrument has a long history of association with rowdy activists, sultry libertines, genre iconoclasts, and all manner of rebellious spirits. “Every instrument seems to attract its own characters,” Matt Haimovitz, a noted cellist, explained to me. And for cello, that means musicians with a strong distaste for authority of all sorts. Perhaps the most Olympian cello personality of all was the Russian Mstislav Rostropovich (1927-2007), a performer whose commanding stage presence was matched by his advocacy for Soviet-era dissidents. Under Leonid Brezhnev’s regime, Rostropovich and his wife, the soprano Galina Vishnevskaya, sheltered the dissident novelist Alexander Solzhenitsyn in their country house—one of many gestures that led to canceled concerts and recordings. Declared “ideological renegades” by the state, Rostropovich and his family fled to Paris in 1974. Soon after, the Soviet Union revoked their citizenship. It was restored in 1990, a year after the cellist gave an impromptu recital at Checkpoint Charlie in Berlin as the wall was being torn down. In the early 1990s, he rushed to support the embattled Boris Yeltsin. While the cello is sometimes identified with public gravitas—think of Yo-Yo Ma’s performances at Sen. Edward Kennedy’s funeral or the 10th anniversary of Sept. 11—cellists themselves are often portrayed as free spirits in their private lives. In the Amazon Prime series Mozart in the Jungle, Cynthia (played by Saffron Burrows) carries on multiple romantic relationships with professional colleagues, including with a union attorney played by Gretchen Mol. The biopic Hilary and Jackie depicted the late cellist Jacqueline du Pré as a “selfish seductress” who has an affair with her sister’s husband (a debated historical point). And there was Kara Milovy, the sniper-cellist in the 1987 James Bond film The Living Daylights. A 2007 survey of a survey of professional and amateur musicians in the British classical music magazine Muso identified the cello as the “sexiest instrument” and reported that cellists make the best lovers. Another bit of evidence for this notion: When Pablo Casals was 80, he married his third wife, 21-year-old former student Marta Montañez. “I’m going to enjoy myself,” he bluntly told his doctor and friends. “And if the girl dies, she dies.” The Croatian crossover duo 2Cellos and the self-described cello goddess Maya Beiser are among contemporary artists to embrace a sultry image. Beiser champions modern composers while favoring a high-fashion bohemian look (knee-high boots, edgy downtown designers), and 2Cellos go for guitar-hero bravado; all black T-shirts; artful stubble; and a repertoire spanning AC/DC, U2, and Michael Jackson covers. There’s even a cello-metal subgenre, pioneered in the 1990s by Apocalyptica, a Finnish quartet that started out covering Metallica songs, and Rasputina, a cello-driven band from New York. Doug Jenkins, the founder of the Portland Cello Project (an all-cello band) believes that cellists are motivated by “an attempt to prove we can do more,” exploring percussive textures or playing in the manner imitative of electric guitars. Since founding the band in 2007 as a way to bring the Oregon cello community together, Jenkins and his colleagues have played jaunty covers of Taylor Swift’s “Shake it Off” and keening arrangements of Elliott Smith and Radiohead songs. Other cello rock groups have added electronic pedals and distortion effects.